Just minutes earlier, I’d caught a local bus from the center of town (which set me back about 50 cents) and zipped down the coast, away from tourists and touts. I’d done the same thing a dozen times by that point, each trip to a different beach. I couldn’t get enough of it. Just a few days before that — in stark contrast — I was touring vineyards and tasting Mexican-grown coffee on farms way up in the mountains. See, I spent nearly 6 months traveling around Mexico as a digital nomad. And during that time, I really got to know the country, from the artsy-bohemian mountain towns, all the way down to some of the most gorgeous beaches you’ll find in all of North America. Instead of leading you through the ups and downs of a long-term travel journey, though (scorpion scares included, and we all know you don’t want that), I’ve consolidated all the insight I gained into a 2 week Mexico itinerary — one that’ll have you traversing the country to some of the best hot spots most tourists will never lay eyes on. During your 2 weeks in Mexico, you’ll be navigating like a local, finding hidden gems your tour book forgot to mention, and put simply, backpacking Mexico like a pro. 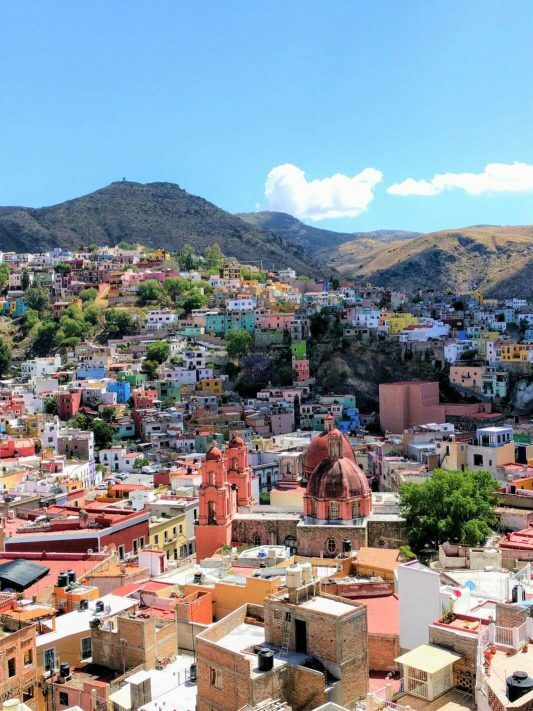 If you want to experience a side of Mexico most people don’t even know exists, start your trip by flying into Del Bajio International airport in the state of Guanajuato. Upon landing at this tiny airport and making your way through immigration (where only about 3 or 4 agents are ever needed at once) grab a taxi from the stand as you walk into the arrivals area. Don’t worry, you can pay in USD if you want, with the ride setting you back about $20. Less than 45 minutes later, you’ll be stepping foot into the storybook-like streets of one of the most picturesque Mexican towns around. 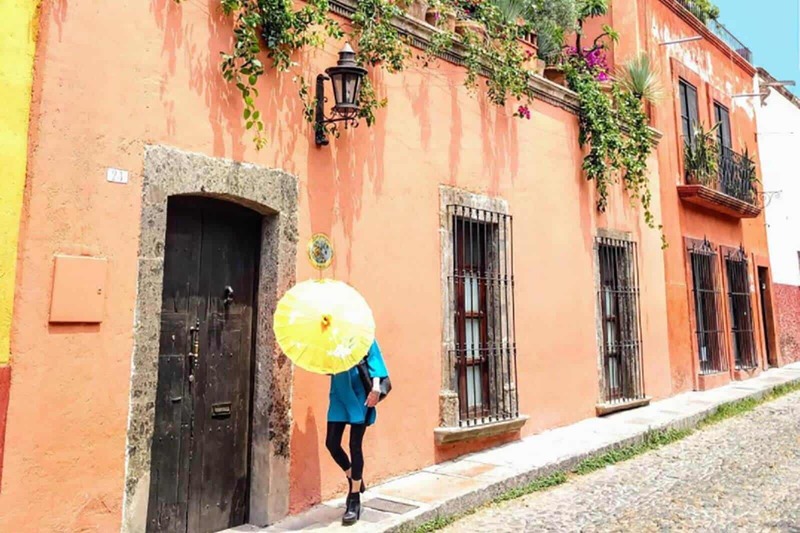 Colorful buildings consume cobblestone lanes, Roman-like theatres tower over lush city squares, and the way of life — as per usual in Mexico — is simply relaxed. After getting your bearings (and probably finding yourself lost down a few alleyways in the process), start your day ready to soak in everything this city has to offer. Guanajuato is a city of stairs. Set in a bowl-shaped valley with mountains surrounding all sides, there’s really nowhere to go but up, and way at the top, on a viewpoint overlooking the entire brightly-colored city is Pipila Monument (Monumento al Pipila for you Spanish speakers out there). 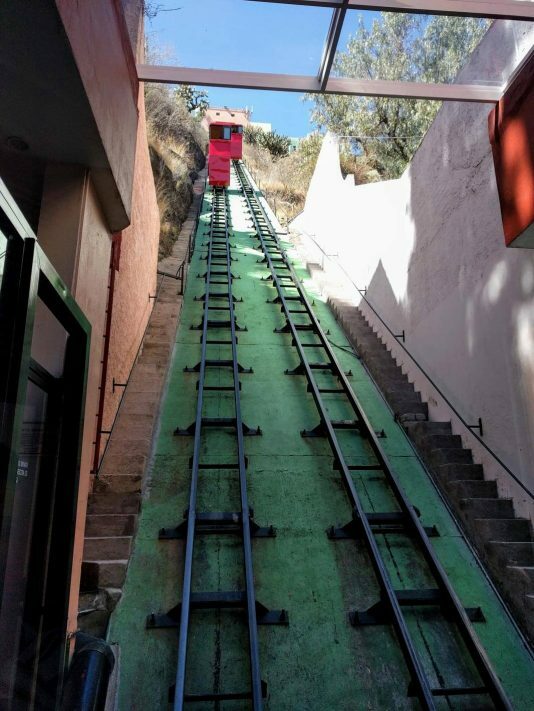 While you can climb the stairs to the monument and lookout (and sweat buckets on the way), a better way to reach the top is by riding the city’s old funicular. You’ll easily find the base of the funicular by heading to Teatro Juarez, where the entrance is just around the corner. Pay about $1 to head up, and prepare for an awe-inspiring view. Spend a little time at the top checking out the street vendors around the monument. You’ll find carts selling every kind of Mexican snack you might want, so indulge to your heart’s desire. When you’re done, get a little adventurous and try navigating your way back down on foot. There are several stairways leading down to the heart of the city, so pick your poison and get ready for a hike. If you’re ready for some food (or tequila?) once you hit the bottom, Guanajuato has you covered. Head to Los Campos, where you can order Mexican-style tapas and pair your meal with a side of guacamole and seasoned grasshoppers (not joking) — a dish Los Campos is famous for. If you’re feeling the vibe, spend the rest of your evening tasting their mezcal varieties and catching some live music. Just be sure to make reservations ahead of time. Don’t be put off by the name. The Museo de las Momias, otherwise known as the Mummy Museum, it definitely worth a visit. Yes, it’s weird. Sure, it’s unique. But it’s all part of the appeal. I’ll admit, the Mummy Museum is a tourist attraction, but the 100+ mummies belonging to the museum were literally found in a cemetery nearby. You likely won’t see each individual mummy, though, as a portion of the exhibit frequently travels internationally. You can easily take a local bus up the hill to visit the museum, with the trip and admission costing a few bucks — no taxi necessary. Your Mexico itinerary won’t be complete without a food tour, and this is the place to do it. 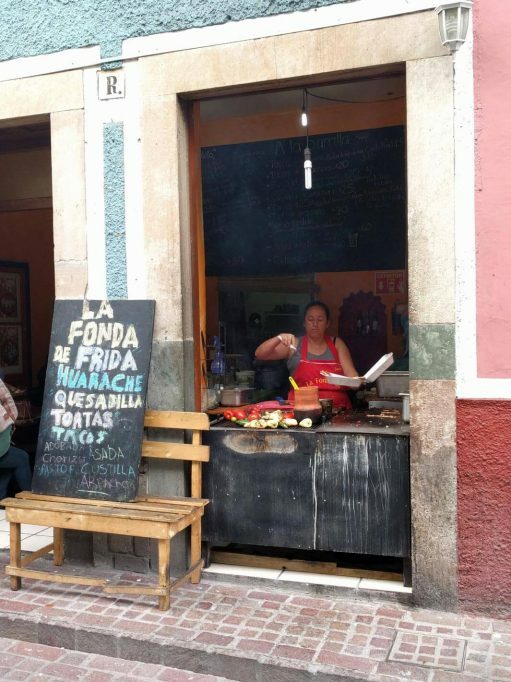 Mexico Street Food Tours is one of the best companies around, and if you’re looking to cut costs while backpacking Mexico, they certainly won’t break the bank. Food tours are fantastic for getting the low down on the local grub! For less than $30, you’ll spend 3 hours touring local markets, trying everything from traditional Mexican pastries to fresh fruit juices, tamales and more, and even sitting down for a full, traditional meal — the kind you’ll find in truly local restaurants. There’s no way you’ll be hungry afterward, which means it’s the perfect time to try something else Mexico is known for — its mountain-grown coffee. You’ll find cafes all over the city, and if you’re anything like me, you’ll already have tried enough coffee to keep you buzzing for days. If you haven’t ventured into the caffeine side of this charming town, though, there are two spots you can’t miss: Cafe Tal and Cafe Conquistador. Cafe Tal is both a roastery and coffee shop, split between two buildings and two levels of seating. Order your favorite drink (everything on the menu is worthwhile), then pick a table by the windows overlooking the busy street outside, where you’ll see kids walking to school, locals going about their day, and a few tourists testing their navigation skills. Cafe Conquistador — more of a shop-front than a full-blown cafe — is conveniently located near Jardin de la Union, which pretty much marks the center of town. Grab a fresh brew and revel in the flavors. You won’t be disappointed. You might not expect to be heading to the theater during your 2 weeks in Mexico, but try walking past this building without going in, and you’ll inevitably be drawn back at some point. 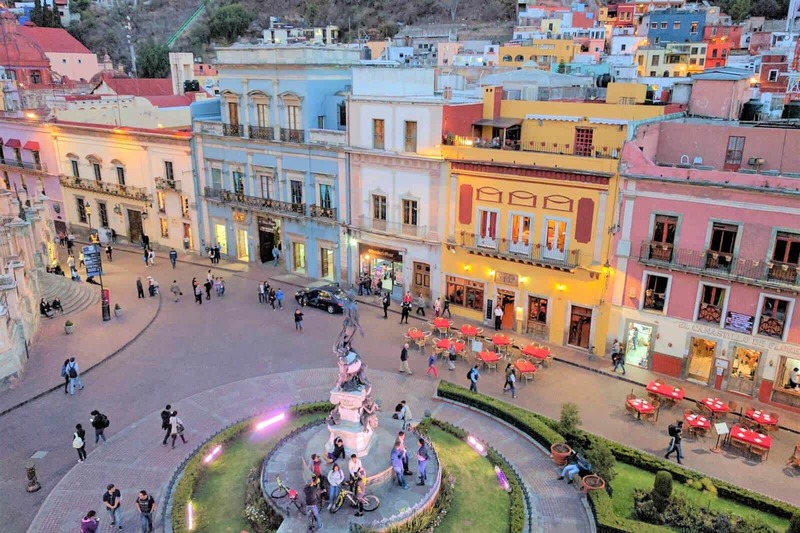 The outside might seem touristy because Teatro Juarez sits right beside one of Guanajuato’s most famous squares (think street performers, people selling trinkets, and outdoor cafes), but you won’t be doing the place justice if that’s the only part you see. 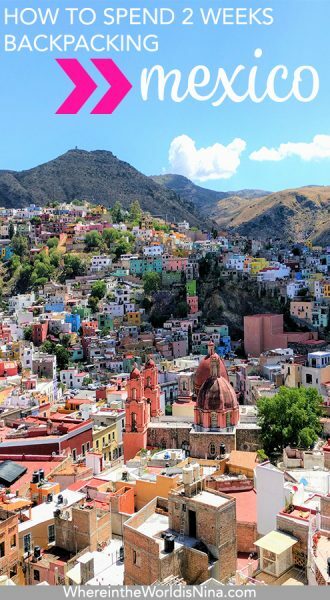 There ‘s plenty to see in Guanajuato besides the main square. Walk up to the information desk inside and ask the attendant what’s playing that evening. Whatever it is, you can bet it’ll be amazing, so grab a ticket (they’re cheap, don’t worry), and head back when the show starts. I guarantee you’ll be feeling like you’re in some grand European town in no time (but here, you can finish the night with some damn good tequila and tacos). 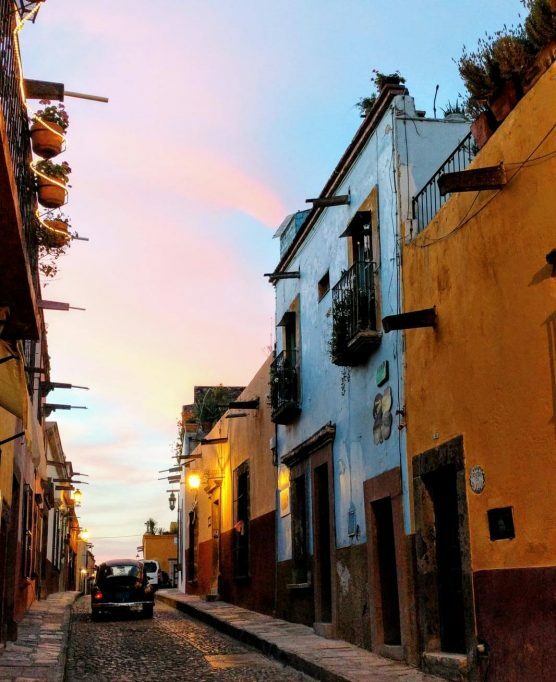 If there’s a Mexican mountain town even slightly more charming than Guanajuato, it’s San Miguel de Allende. 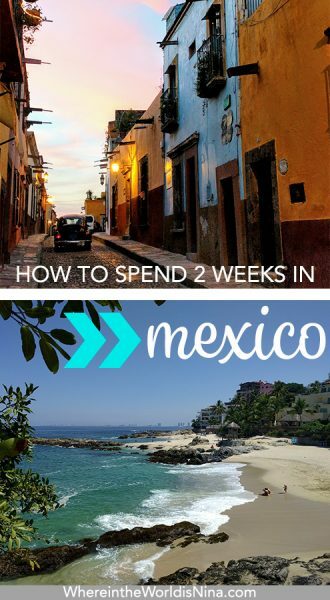 Fortunately, the two cities sit just an hour and a half apart by bus, making them easy to pair together during your 2 weeks in Mexico. There are several bus companies operating coaches for the trip, but I opted to go with Primera Plus. Don’t worry about heading to the bus station to buy tickets (or messing with their painfully slow websites). Just stop into one of the many Oxxos you’ll see around Guanajuato (Mexico’s version of 7-11), and buy your bus ticket from the cashier. A one-way trip will set you back around $7 USD, plus the cost of taxis to the bus station in Guanajuato and from the station in San Miguel (expect to pay $4-5 total). While Guanajuato is small and winding, San Miguel is much more spread out and open. It’s artsy, health-focused, and simply teeming with side streets and passageways to explore. After so much traveling, I often find myself overlooking markets because of how touristy and kitschy they can be. The Artisan Market in San Miguel, however, was one I spent an entire afternoon getting lost in. This market starts a short walk from the Plaza de Armas (don’t forget to stop there for some breathtaking views of the impossible-to-miss cathedral, and if you’re lucky, a street parade with mojigangas, which look like life-sized puppets dancing around (totally weird…but cool). Find the entrance to the market in a nondescript building along a side street, and prepare for an overwhelm of the senses. Go get lost in the market. The first portion of the market offers flowers galore. Keep making your way through, and you’ll see normal housewares, clothes, and locals doing their daily shopping. 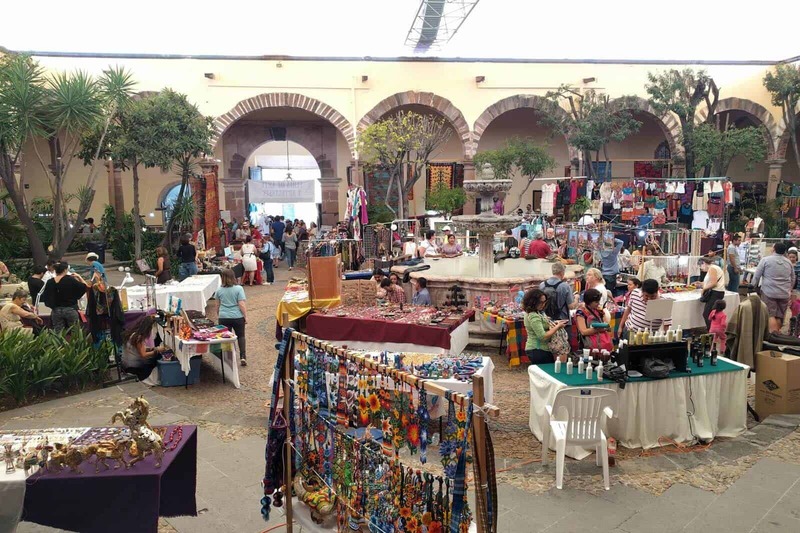 Beyond is a maze of souvenirs, but keep walking and you’ll find things like gorgeous rugs, Mexican chocolate, silver, jewelry, and so much more. The market traverses several streets — you’ll have to cross some as you wander in and out of its different sections — and you’ll undoubtedly question whether you’ll ever find your way back. Once you hit the end, though, just turn left. Follow the street for about 5 minutes, and you’ll see that same pink-orange cathedral you started from. If you didn’t know Mexico produced its own wine, you’re not alone. 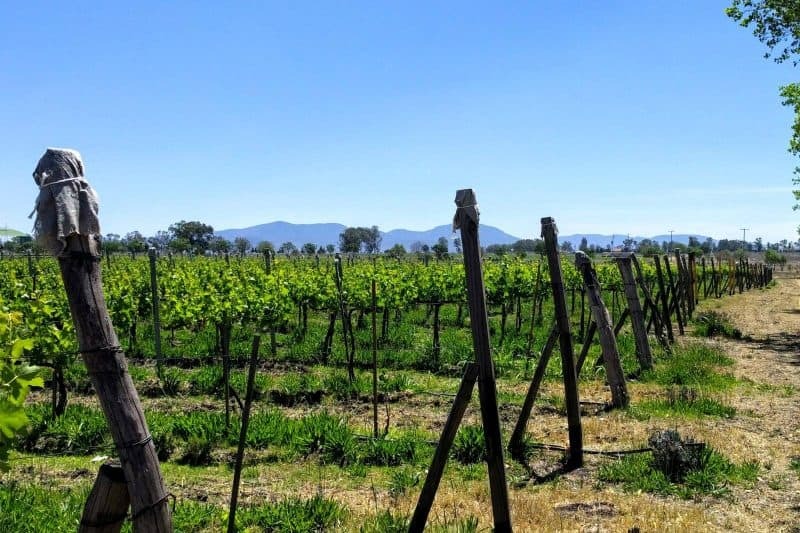 In the mild climate San Miguel is known for, you’ll find sprawling, family-owned wineries offering tours and tastings. If you’re prone to a glass or two (or, you know…a bottle) every now and then, schedule a tour with Dos Buhos Winery (you can book it online). If you choose the tour plus tasting option, you’ll start in the vineyards to learn about the winery’s different grape varieties. Afterward, you’ll check out the fermentation room, wine barrels, and even the on-site donkeys, which are just as much of a highlight as the wine. Take a glass or a bottle, we won’t judge! You’ll finish up in the vineyard’s giant tasting room, likely with homemade cheese from the owners’ next door neighbors. The easiest way to get there is by grabbing a taxi from anywhere in town. (The vineyard isn’t too far away, but you’ll definitely need transport.) Make sure to schedule a time with your taxi driver to pick you back up, though, or you could be stranded for a while. Pro tip: If you’re backpacking Mexico with a “special someone,” (wink, wink) they also offer tours with picnic lunches (and wine tastings). 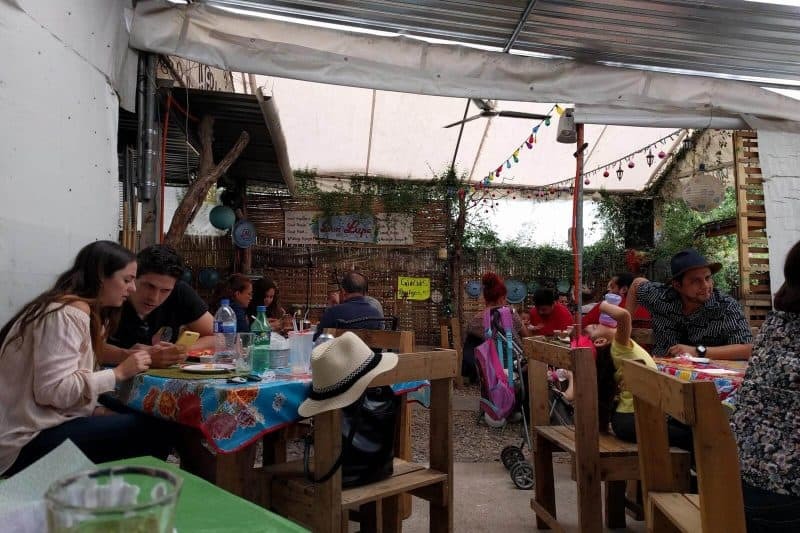 There are so many good restaurants and cafes sprawled throughout San Miguel, you’ll have no problem finding something you like. If you want to try the perfect mix of this town’s take on Mexican food and ambiance, though, plan a DIY food tour. Start with breakfast at Cafe Oso Azul, less than a 5-minute stroll from the Plaza de Armas. Walking into this cafe is like stepping into another world. From the street, it doesn’t look like much, but after taking just a few steps in, you’ll be greeted by a quaint courtyard overgrown with vines, flowers, and green…everywhere. During my visit, I was lucky enough to witness some live, daytime music, complete with an acoustic guitar and trumpet. Their food is delicious, but their coffee (grown in the Mexican state of Oaxaca) puts up a good fight for the spotlight. After wandering through the streets (inevitably getting hopelessly lost), sit down to lunch at a local hole-in-the-wall, Don Lupe Mexican Grill. On your way there, you’ll feel like you’ve gone a couple streets too far off the beaten path, but you’ll soon find that’s a very good thing. Don Lupe Mexican Grill is a good spot for a break in San Miguel. Outdoor seating is covered by a makeshift roof, and Mexican families will be taking up most of the tables at lunchtime. Order anything off the menu — you won’t be disappointed — and pair it with chips and guacamole. If you’re really feeling the vibes, order a Michelada, a traditional spicy Mexican drink made with beer. If you’re still hungry for dinner after doing a little more wandering, make Luna Rooftop Tapas Bar your last stop. Even if you’re not up for a full meal, you can indulge in a few Mexican tapas, order a drink with local tequila, and watch the sunset over the heart-pounding San Miguel skyline. This isn’t a spa in the traditional sense — it’s better. San Miguel is blessed with nearby hot springs-turned-spas, and if you’re looking for a way to relax after all your walking, head to La Gruta — you can grab an Uber or taxi to get there. With a restaurant on-site, you don’t need much besides your swimsuit and towel. You can opt to spend the day lounging in their collection of thermal baths or take part in their spa offerings, depending on how you feel. There’s no need to tell you Mexico is full of breathtaking beaches; it’s what most tourists flock there for. But while you’ve likely had Cancun and places like Cozumel on your radar, Puerto Vallarta might have slipped by. Putting it front-of-mind is smart, however, because this old fishing town boasts some beautifully secluded Pacific beaches. Sure, the tourist beaches are pretty, but there’s a whole other world just waiting for you less than 20 minutes away. When an orange and white bus with the words “Boca” or “Mismaloya” on the windshield pulls up, get on board and pay the driver in pesos (the equivalent less than $1 USD). Once the bus is full (it won’t take long as most locals head south for their beach days, too), hold on tight because the ride is bumpy. Over your next few days in Puerto Vallarta, you’ll get on the same bus, but get off at different beaches each time. When you get on board, tell the driver which one you want to get off at, and they’ll remember to stop. If all else fails, follow along on Google Maps during the drive so you know where to stop. Pro tip: To signal the driver to stop (they’ll stop anywhere along the way), either press the button at the back door of the bus (usually on the railing or ceiling above the door), or walk to the front and simply tell them you need off. Riding public buses in Puerto Vallarta can seem confusing at first, but you’ll get the hang of it. 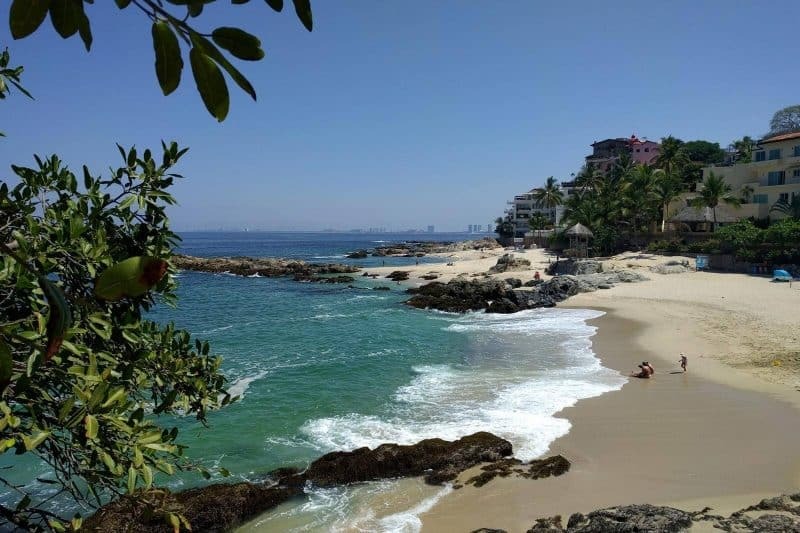 You’ll hop off the bus near an Oxxo, and from there, walk toward the Lindo Mar Hotel, where you’ll find a staircase that takes you all the way down to the water. It’ll feel weird walking into the lobby of the hotel, but no one will say anything. Just walk in, veer left down the stairs, and keep following them until you’re spit out by the shore. Once you’re at the bottom, turn right and follow the cobblestone street until you hit the beach (you’ll recognize it by its small coves, white sand, and crystal-clear, blue water. Rent an umbrella for about 500 pesos for the day (someone will come along within minutes to ask if you want one), lay your towel out, and settle in. The tourists will be few, but the views many. 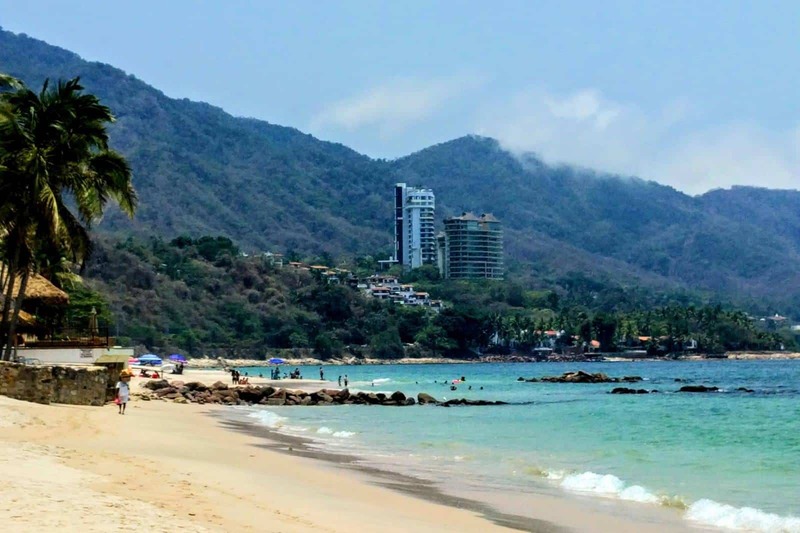 Pro tip: If you don’t want to take the bus back from there, you can walk along the shore all the way back to the main beaches of Puerto Vallarta. You might have to traverse some rocks on the way, but the walk is beautiful. Just make sure the tide isn’t too high. While Conchas Chinas is arguably more pleasing on the eyes (because of its hidden-beach feel), Playa Punta Negra is my absolute favorite. Take the same bus, and make sure to tell the driver “Punta Negra” when you get on. You’ll be dropped off in what feels like the middle of nowhere, but just to your right, you’ll find a long staircase heading straight down to the beach. If you’re lucky, you’ll be able to grab a few fallen mangos on the way down. Not so secluded, but still beautiful. Once you get to the bottom, if it’s a weekend, you’ll probably see several Mexican families setting up camp for the day. If you’re looking for some privacy, just head left (it’s the only way to go — you’ll see a black cliff cutting off the beach in the other direction). Walk down 100 meters or so, and you’ll have a long stretch of sand all to yourself. There’s no food around this beach, so make sure to bring your own if you’re staying for the day. “Gemelas” translates to “twins” in Spanish, which is fitting for this beach, as it’s split in half by a building of condos (giving the appearance of twin beaches on either side). If you’re looking for that quintessential beach day during your 2 weeks in Mexico, you’ll find it here. Playa las Gemelas feels slightly less “local” than the others, simply because of the condos splitting the beach, but you’ll rarely find it crowded. Finding the entrance to this beach is a little more tricky. Ask the driver to drop you at Girasol Sur Condos, and right before you reach them, look for a public staircase leading down to the beach (if the driver drops you past the staircase, you might have to backtrack a bit). While you can walk through the condos to get to the beach, you have to eat at their restaurant in order to do so. If you’re backpacking Mexico on a budget, take the public stairs. Just like you took the orange bus to each of these beaches, once you’re ready to head back home, walk to the opposite side of the road and flag one going in the other direction. Make sure you’re standing in a spot with enough space for them to veer off the road a bit (or just walk to the nearest bus shelter). Pay in pesos again, and enjoy the scenic ride back. At least once during your visit to Puerto Vallarta, eat at Pancho’s Takos. You won’t spend more than $3 on a full meal there, and you simply can’t leave without trying the tacos al pastor! 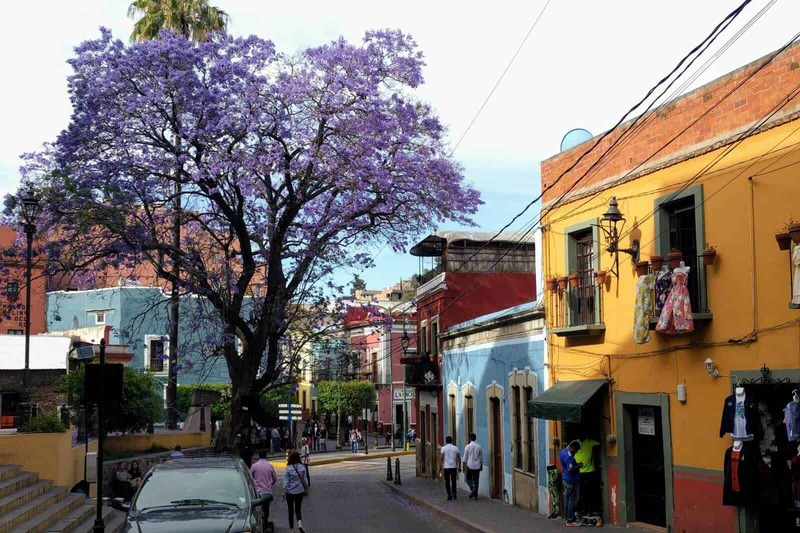 Heading to Mexico City next and adding a few extra days to your Mexico itinerary? Here’s a guide on how to spend 3 days in the city! So! Let us know in the comments—when are you headed over to Mexico? A 3 Day Mexico City Itinerary: Boats, Pyramids, Churros, & Squirrels? Click the picture and pin this for later! These are some great suggestions Nina! I’m so glad I discovered your blog, it will be so helpful in my trip planning. Wonderful! And never forget the streets food! I love it! Virginie, I seriously dream about the street food there! !